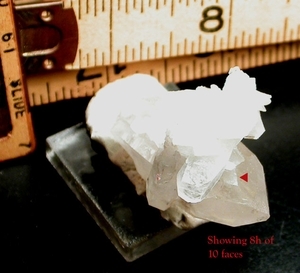 Sometimes the most unimposing crystals demand the most attention: this Arkansas thumbnail-sized quartz cluster with a chipped tip and less than stellar clarity as it formed with calcite happens also to have a nearly impossible 10h faced crystal - double diamond windows and two "regular" s faces. Of course, one s face and the diamonds descend the side hovered over by the rest of the cluster and so wait for your personal inspection and delight. The camera has done the best it could. This anomaly is 1/2"x 1" tall, with that chip and rainbow foils. The rest of the cluster, with geometric voids from absent calcite, has crystals to 1/4"x 1-1/8" and is overall 1"x 1-3/8"x 1" tall. Penetrating crystals, light natural etching and spots of sparkling drusy, too.